COLORADO SPRINGS, Colo. — The International Triathlon Union today announced Sarasota, Florida, as a host city as part of 2017 ITU World Cup schedule. The Sarasota ITU World Cup will take place Oct. 7-8, 2017, at Sarasota’s Nathan Benderson Park. Elite triathletes will compete on a spectator-friendly, multi-loop 1,500-meter swim, 40-kilometer bike, 10-kilometer run course through the park, the site of ITU Continental Cup events since 2013. Age-group races will also be contested as part of the overall weekend of events. The United States has hosted a total of 20 ITU World Cup events since 1991, with the most recent being the 2009 Hy-Vee ITU Triathlon Elite Cup in Des Moines, Iowa. Though the Sarasota ITU World Cup will be the first world cup held on U.S. soil since 2009, the nation has hosted a number of international events as part of the ITU schedule, including five ITU World Triathlon Series races: Washington, D.C. in 2009, San Diego in 2012-13 and Chicago in 2014-15, which served as the host city for the ITU World Triathlon Grand Final and Age Group World Championships. 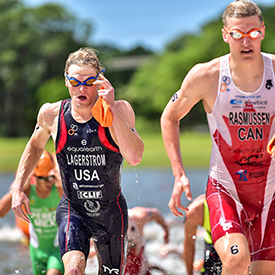 Sarasota is one of five ITU World Cup events contested in four countries in the Americas. Other events in the region include Merida, Mexico, also a first-time World Cup host; Cozumel, Mexico, the host of this year’s ITU World Triathlon Series Grand Final; Salinas, Ecuador; and Buenos Aires, Argentina, which will serve as the final ITU World Cup event of the season. There are 17 total ITU World Cup events on the schedule for the season.